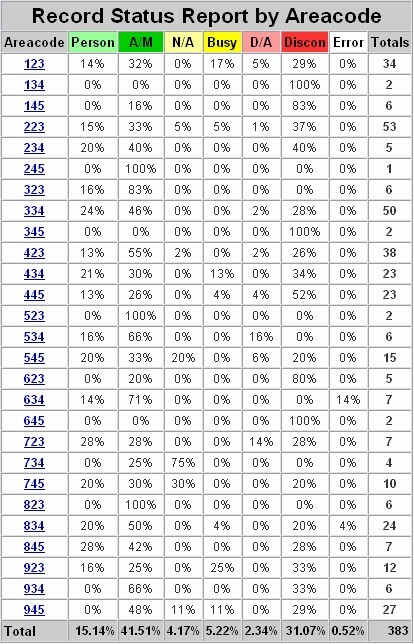 Area Code - Lists the area code associated with the following status percentages. Person - Percentage of calls in area code that connected with a person. A/M - Percentage of calls in area code that connected to an answer machine. N/A - Percentage of calls in area code where there was No Answer. Busy - Percentage of calls in area code that were busy signals. D/A - Percentage of calls in area code where a dead air signal was returned. Discon - Percentage of calls in area code where the number was disconnected. Error - Percentage of calls in area code where phone system detected an error. Totals - Total number of calls in area code.